A beautifully presented hardback storybook exciting children to have adventures reading the Bible! But his favorite stories are all in one very special book. Join Alby to discover why his loves his amazing book so much and what makes it so special. A beautifully presented hardback storybook, exciting children to have adventures reading the Bible! 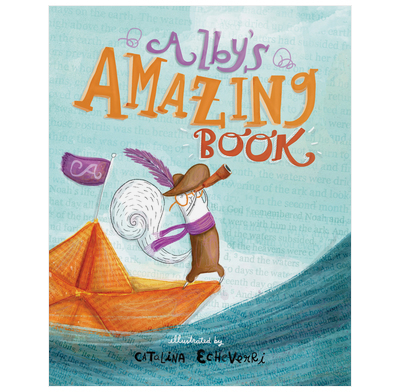 Beautiful illustrations by Catalina Echeverri and a storyline that is full of fun and adventure while also showing children how exciting the Bible really is. 6.1" x 7.7" x 0.2"
As a faith educator, I couldn't be more excited about this book! I just wish it could be larger so that we could share it with a class as a read aloud. Hoping the publisher will take note and print a larger edition for us! A lovely book, with pretty pictures, but surprisingly small. A bit disappointing. A beautifully presented book, inviting the reader into lots of imaginary journeys. A pleasure to read. Stunning artwork. Ideal as a gift.